Mrs S was diagnosed with diabetes in her late teens. She developed a ulcer on her toe and was advised that amputation. 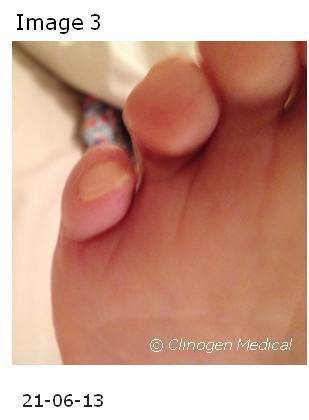 The patient was advised to use a combination of Youki Bio-Cell Spray and Youki Skin Repair Cream on the affected toe and peri-wound area. The results show the progress of healing over a period of 18 weeks. The regimen consisted of the Youki Bio-Cell Spray being applied to the wound site (Image 1) 6 times a day for the first 30 days and then reduced to 4 times a day evenly throughout the day. The periwound skin was treated using Youki Skin Repair Cream which helped to rehydrate, nourish and strengthen the skin. The patient was advised that application of the protein based spray-on dressing should be continued as the formation of the film and its shedding would occur a number of times until the wound site had healed both upwards and inwards (Image 2). As the wound healed the patient continued to use the Youki Skin Repair Cream on the surrounding skin to ensure that this strengthened and supported remodelling of the edges of the wound site. Once the wound was fully healed (Image 3) it was recommended that the patient continue use of the cream for four weeks.